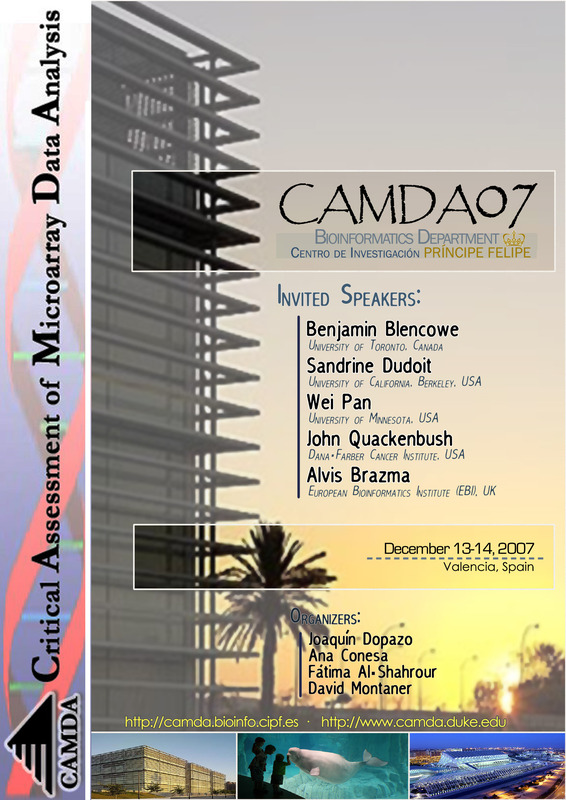 CAMDA 2007 offers researchers from computer science, statistics, molecular biology, and other areas an opportunity to benefit from the critical evaluation of various techniques in microarray data analyses. For the first time CAMDA has left its traditional location at Duke and has moved overseas to Europe. This year's venue is the Centro de Investigación Príncipe Felipe in Valencia, located in the east coast of Spain (see location) . This year we will have two challenge datasets. One of them was already used in CAMDA 2006, but given its interest we propose its use this year again. This dataset, from the CDC Chronic Fatigue Syndrome Research Group , contains gene expression, proteomic, SNP, and clinical data. We hope this will foster integrative and biological goal-oriented analysis. Additionally we propose another dataset composed by 6000 arrays of diseased and normal human samples and cell lines collected from ArrayExpress and GEO. This second dataset poses challenging questions on large-scale data analysis and visualization.